There was a February industrial production rebound in the United States, according to figures released by the Federal Reserve System (Fed). The recovery was driven by a sharp increase in automobile and consumer goods factory output. 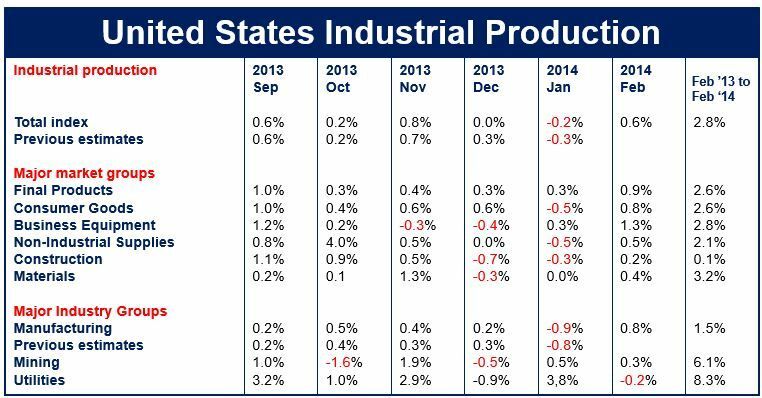 February industrial production increased by 0.6% compared to January, which had registered a 0.2% decline. February manufacturing output increased by 0.8%, not quite enough to completely reverse January’s 0.9% fall. Manufacturing output in January had been affected by extremely harsh weather conditions. February’s factory production gain was the biggest since August 2013. Utilities output in February slipped 0.2% after a January 3.8% increase, while production at mines edged up 0.3%. February industrial production, at 101.6% of its 2007 average, was 2.8% higher than in February 2012. February’s capacity utilization rate for total industry rose to 78.8%, but was still 1.3 percentage points short of its long-run average (1971-2013. Consumer goods production increased 0.8% in February, and was 2.6% higher than in February 2012. The February indexes for consumer non-energy nondurables and consumer durables rose 0.9% and 2.1% respectively. However, the index for consumer energy products declined by 0.8%. The production of automotive products rose by 4.6%, reversing most of January’s decline, while home electronic output grew by 0.7%. These February gains were partly offset by a 1.7% fall in the production of carpeting, furniture and appliances, as well as a 0.1% drop in the production of miscellaneous goods. February production of chemical products, tobacco, foods and paper products all increased by approximately 1% each, while clothing declined by 0.7%. Business equipment production in February grew 1.3% after four months of no increase. The indexes for transit equipment as well as industrial and other equipment rose 1.6% and 2% respectively. After healthy gains from September to January, information processing equipment edged down slightly in February. Business equipment generally registered a 2.8% increase in February compared to the same month in 2013. Defense and space equipment rose 0.2% in February after having fallen by 0.3% the month before. This market group was 2.6% up compared to February 2013. Construction supplies edged up 0.2% in February after a two-month fall. The index for construction supplies was 0.1% higher than in February 2013. Business supplies production increased by 0.7% in February, more than reversing its January fall, and was 3.1% higher than in February 2013. Economists say that February’s figures suggest US manufacturing activity will probably accelerate in the coming months as the weather improves. February industrial production figures are the latest in a series of data coming out of the US that point to a healthy recovery after abnormally harsh weather conditions. The US Labor Department reported that 175,000 new jobs were added in February, after two weak months. The Fed reported earlier this month that the US economy experienced moderate growth in January despite bad weather. January consumer spending rose by 0.4% ($48.1 billion), much more than economists had expected.